Elizabeth Prendiville of Saffronart introduces Anish Kapoor’s visceral Berlin Exhibition. 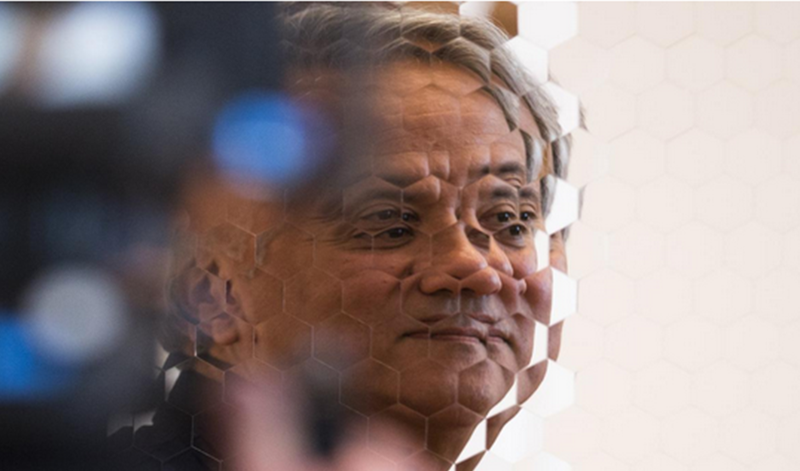 Indian artist Anish Kapoor in front of his work “Hexagon Mirror”. Now on display at the Martin Gropius-Bau in Berlin. New York: On May 18, artist Anish Kapoor opened his exhibition “Kapoor in Berlin” at the majestic Martin Gropius-Bau museum in the city. This retrospective includes around seventy works that were created over the course of his career. Although the show displays works of varying sizes, striking representations of black holes, oversized deflated balloons and distorted mirrors make it a visually gripping presentation. Martin Gropous-Bau museum’s main hall featuring “A Beloved Sun” by Anish Kapoor. 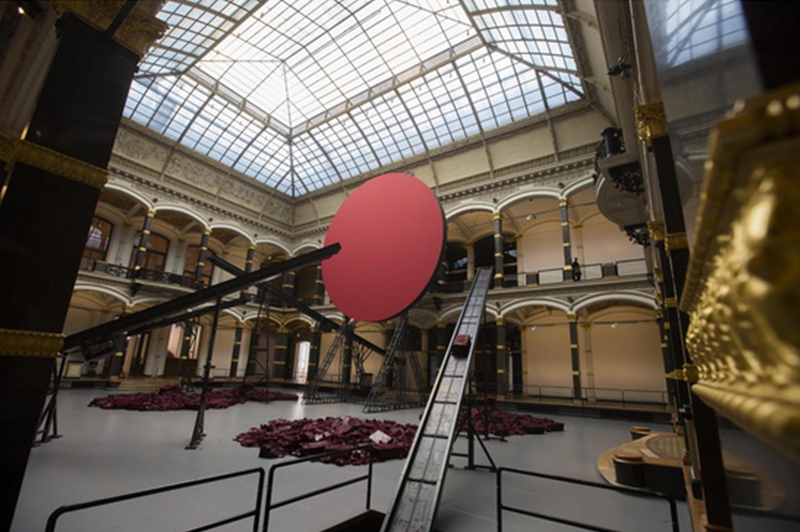 Continuing his reputation for captivating large-scale installations, Kapoor has created “Symphony For a Beloved Sun” in the center of his Berlin exhibition. This piece consists of four conveyer belts emerging from the surrounding walls, depositing a red wax substance on the floor. The contrast between the luxurious architecture of Martin Gropius-Bau’s main hall and this dark and industrial installation is alluringly macabre. The deep, blood red color is a key iconographic element throughout the show and the artist says it has a “visceral reality”. “Shooting Into The Corner” by Anish Kapoor at the Martin-Groous-Bau museum in Berlin. 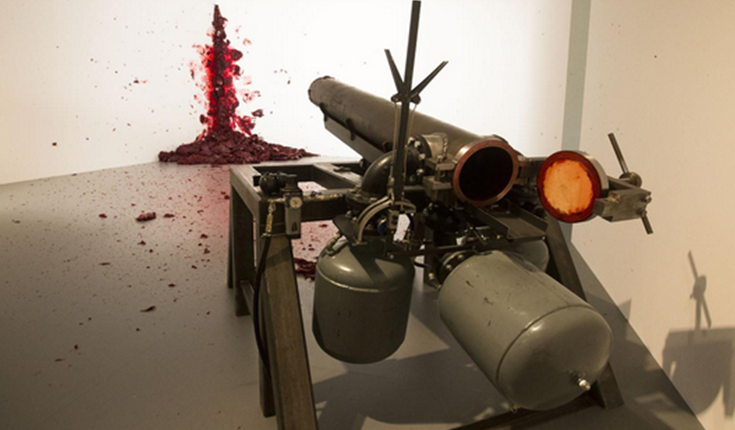 Large-scale pieces such as “Symphony for a Beloved Sun” and “Shooting into The Corner”, which involves a cannon shooting red wax at a wall, will be fully functional during the exhibition’s visiting hours. The performativity of these pieces make the exhibition ever changing and evolving for viewers. Although the works inspire a strong emotional reaction, the artist is quick to assure that his work does not harbor an explicit meaning. Even with strong imagery such as “Shooting into The Corner”, Kapoor claims: “I’ve nothing to say” and that his work does not address any specific subject matter. The artist insists this disconnect is what qualifies as abstract art, never an overt explanation. He creates his works with the desire of creating a dialogue between visitors and the piece, rather than defining a specific interpretation. Kapoor’s work continues to be an enthralling, full-sensory experience for visitors. “Kapoor in Berlin” will be open through November 24, 2013, and visitors to Berlin are encouraged to take in this unique exhibition.